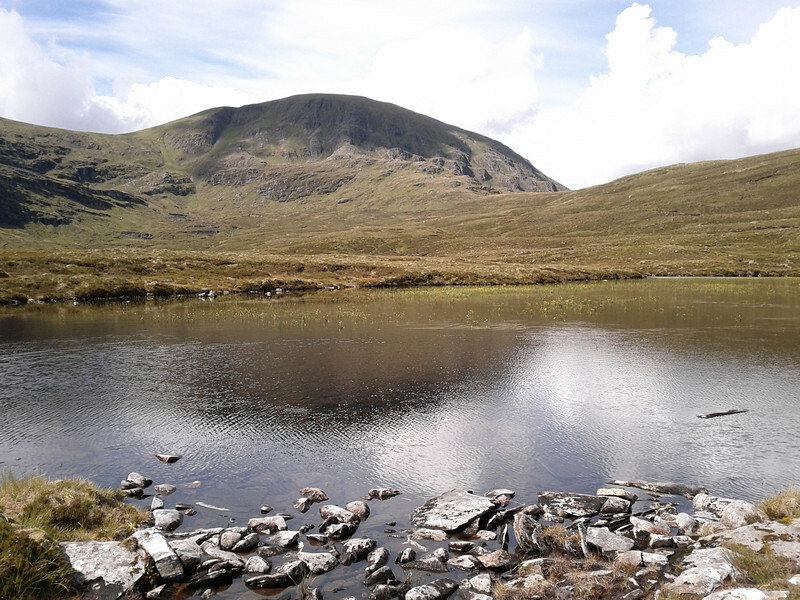 It's one of those hills that I couldn't claim to have heard of before I looked at the map last week, and I also suspect that not too many folk, keen walkers or not, would know without checking that it's one of the Fannaich Munros. I confess that as we were struggling up to the first bealach on the route that I thought it might be the only Munro we were going to get to that day, but loins were subsequently (if slightly reluctantly) girded, and although the weather deteriorated after that first summit, we managed the three hills on a 12 mile circuit in about 7 hours or so. "Cross the dam and follow the track beside the pipeline. 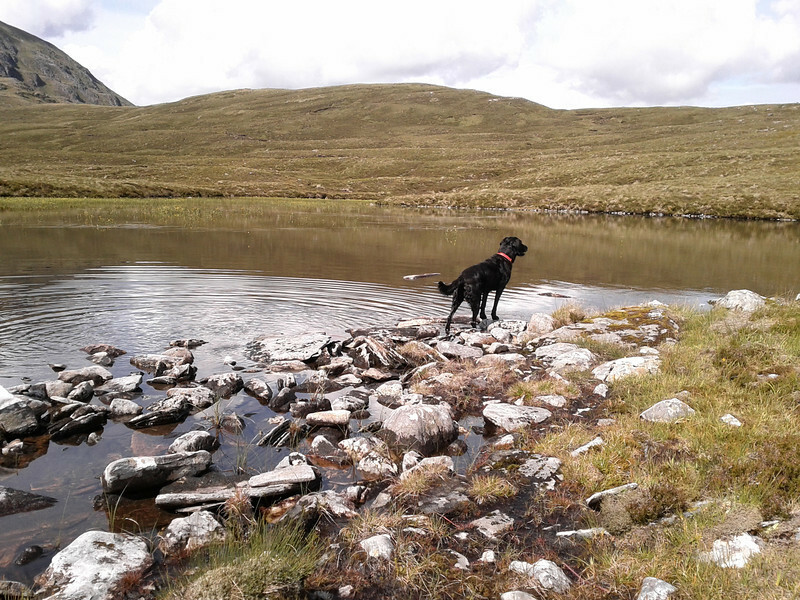 This track eventually ends at a small dam on the Allt a’ Mhadaidh. Just before it a footbridge crosses the stream from where another track climbs in a South West direction towards Loch A’ Mhadaidh. 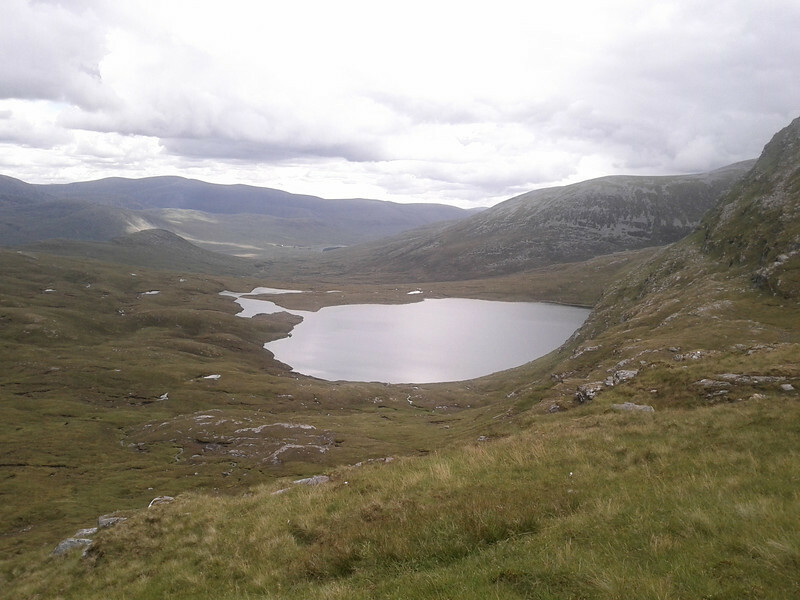 Pass the loch on its North shore and climb to the bealach between Meall a‘ Chrasgaidh and Carn na Criche. 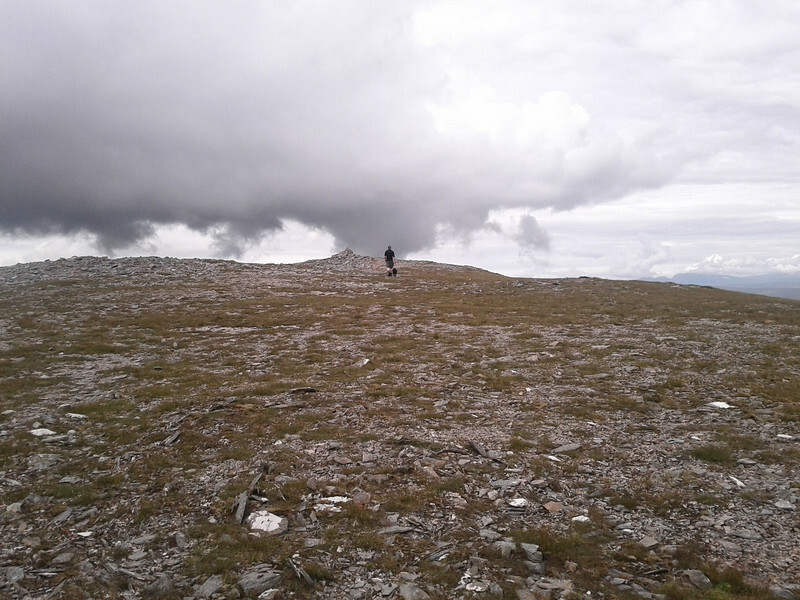 Climb Meall a’ Crasgaidh, return to the bealach, and follow the ridge over Carn na Criche. 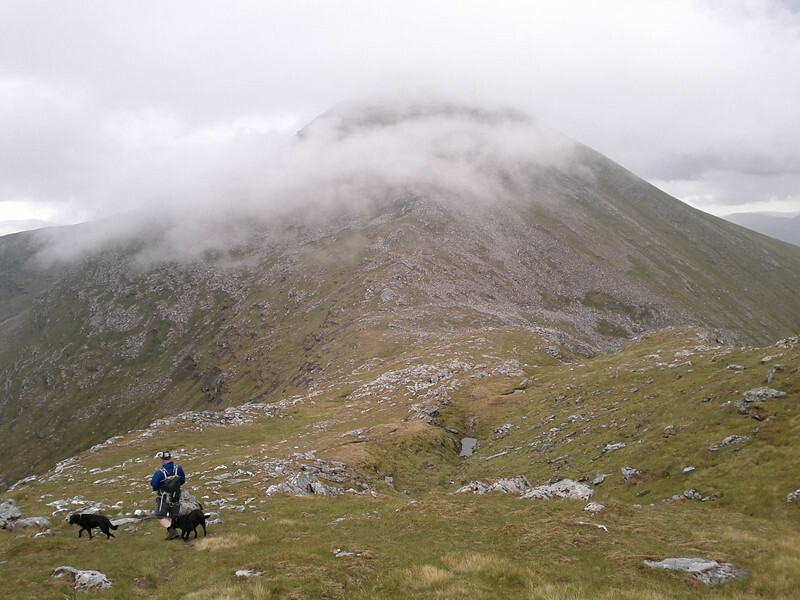 Climb the steep slopes of Sgurr Mor to the summit, descend South East then East to follow the ridge to Beinn Liath Mhor Fannaich. 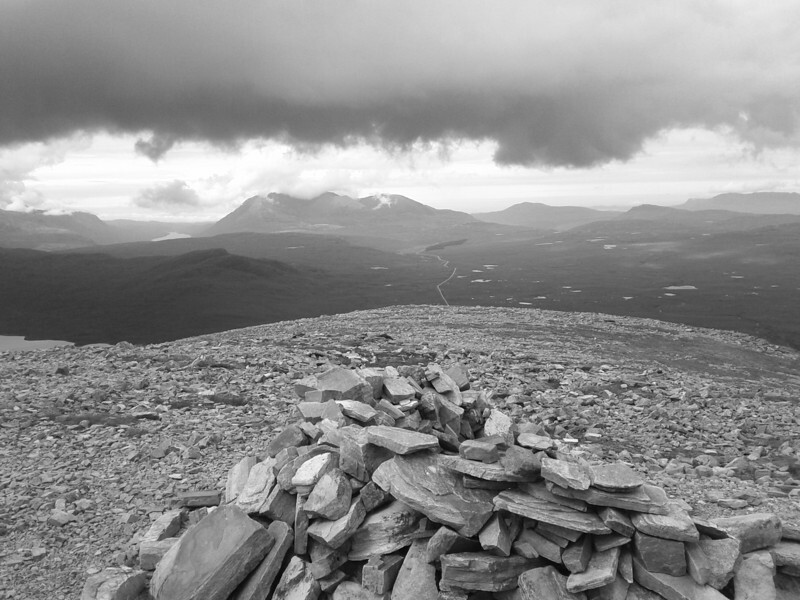 From the summit descend due North, then North East down steep heather slopes back to the Allt a’ Mhadaidh & the earlier hydro board track." 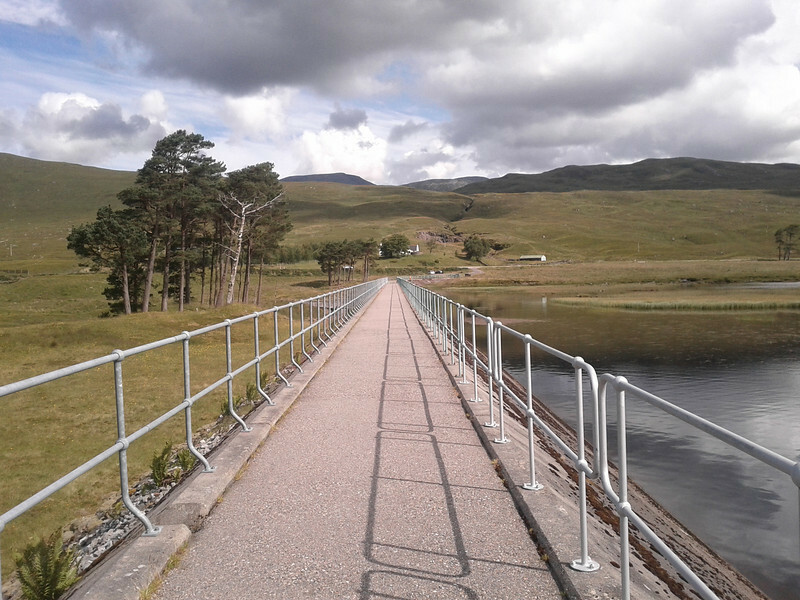 The dam referred to, incidentally, sits just off the A835 Ullapool road, at the north west end of Loch Droma, and there's a wee car parking area right next to it. 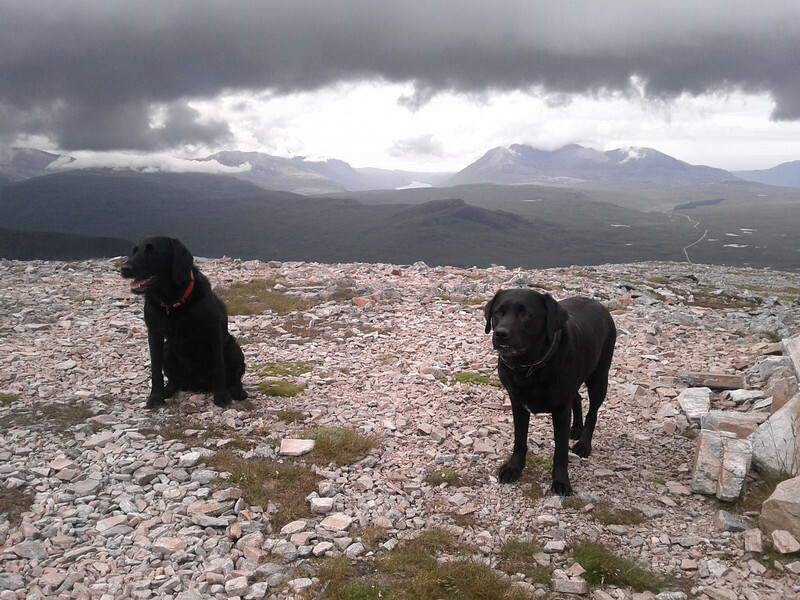 I got a few photies before the clouds rolled in. Arty photo of flowers in loch. It says here. 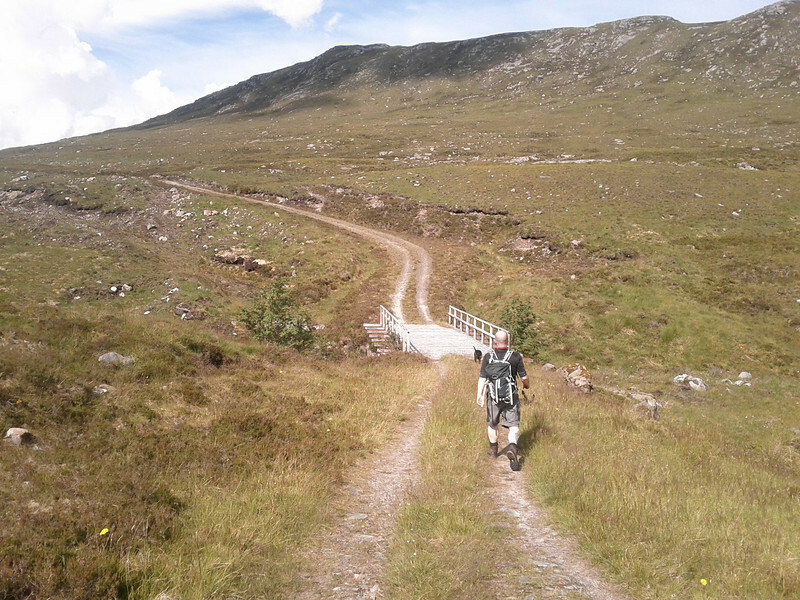 The start of the bealach slog. It's worse than it looks, honest! 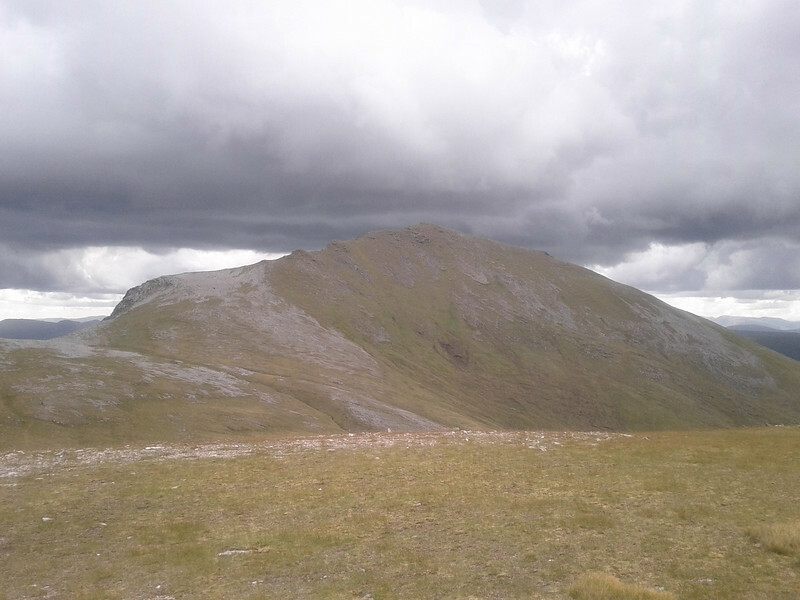 Sgurr Mor from Meall a' Chrasgaidh. 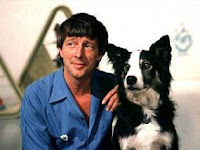 With added dug. 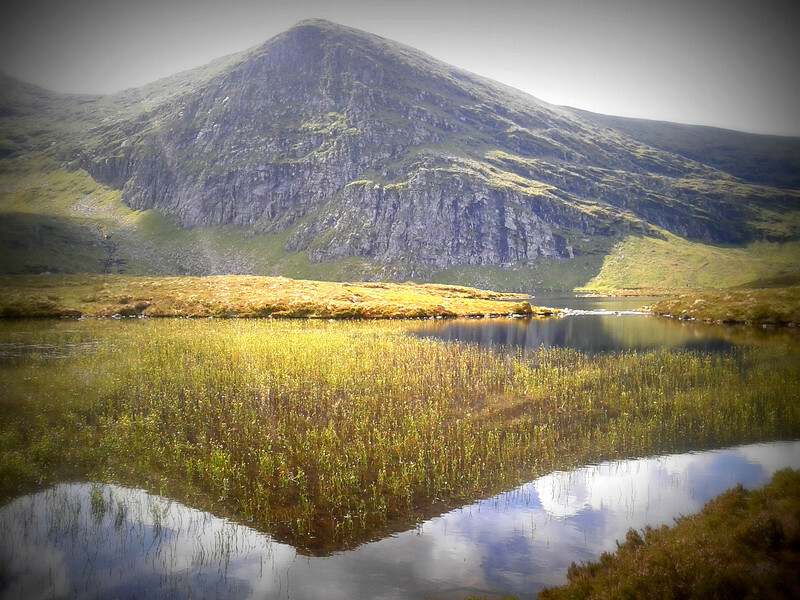 ...and a considerably bigger pull beyond that to Sgurr Mor. It was maybe for the best that the clouds had arrived to spare us too much of a constant reminder as to what we were in for. 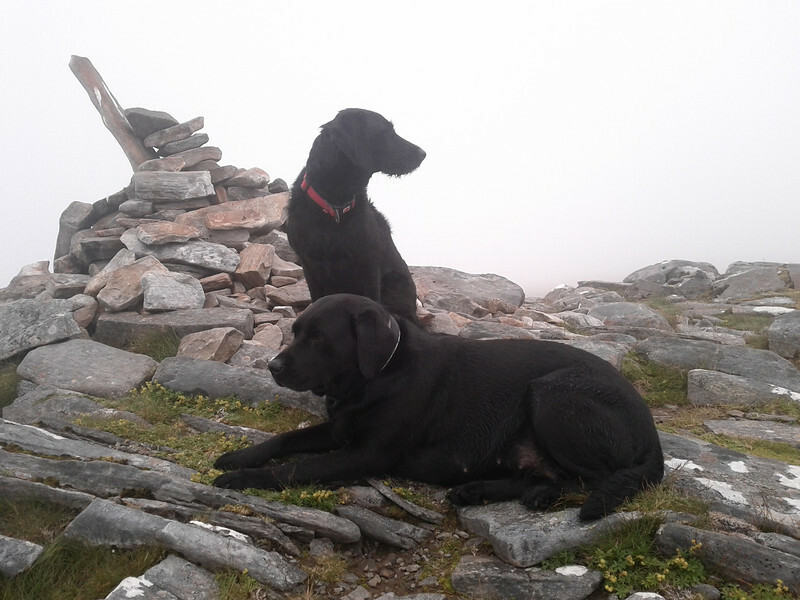 No pictures at the top of Sgurr Mor, as it was a bit of a pea souper by that stage. 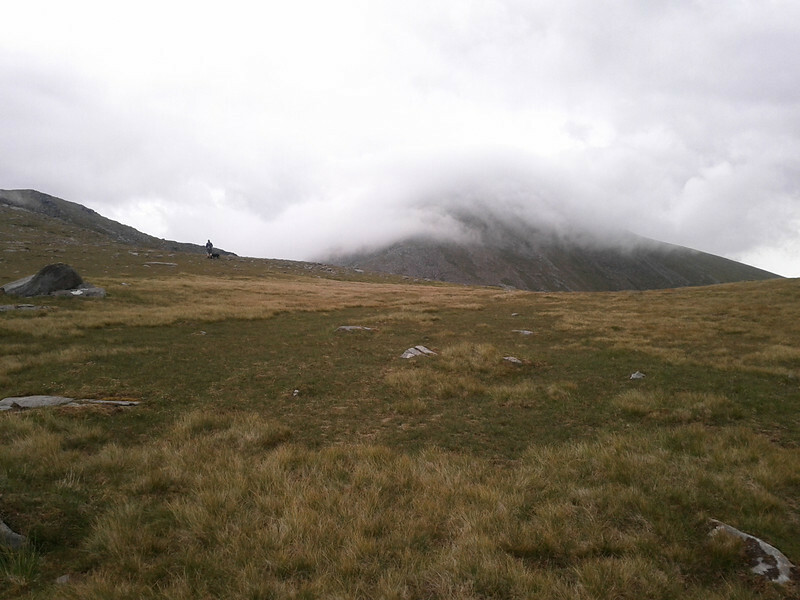 Although the onward route simply involved following the ridge to Beinn Liath Mhor Fannaich, the mist was such that we couldn't really see the ridge in the first place. There's little in the way of a path, but a glimpse of the next hill through the murk at least reassured us we were still heading in the right direction. A stalker's path then sort of materialised, and although we followed it a bit too far, and kind of circled the foot of the hill rather than heading straight up it, the reascent was relatively brief. 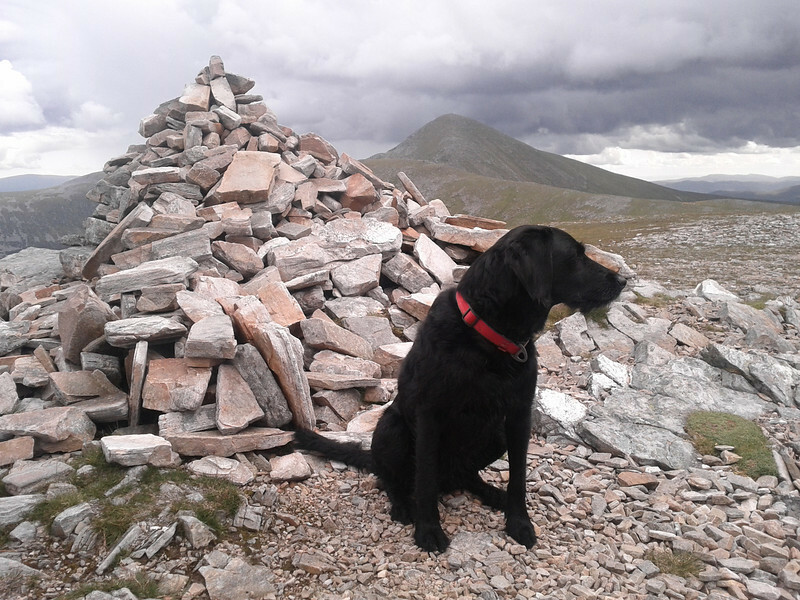 A quick sandwich and a greyish photie of the dugs at the summit, and we headed homewards. 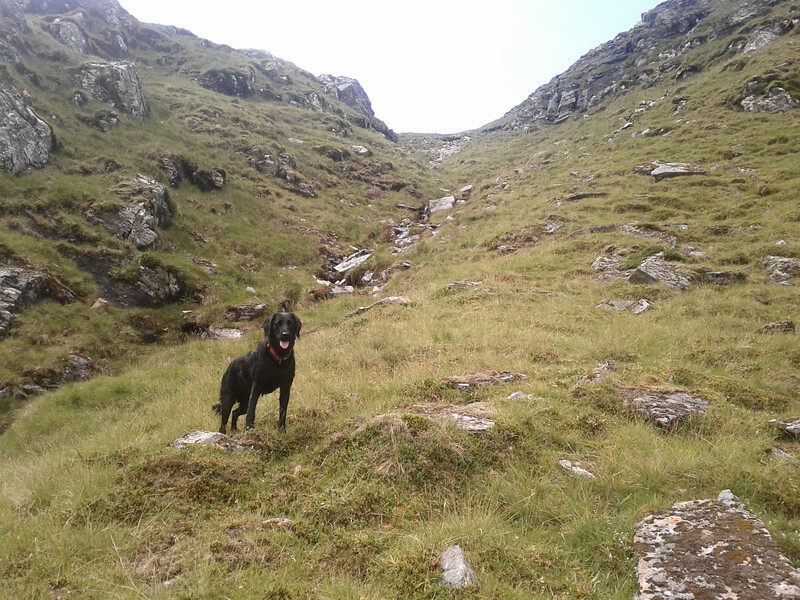 It seems that whatever your chosen way back it involves pretty steep, pathless heathery clambering. Not ideal at that stage of the day, but the car park was in view for much of the time, pulling you on a bit. 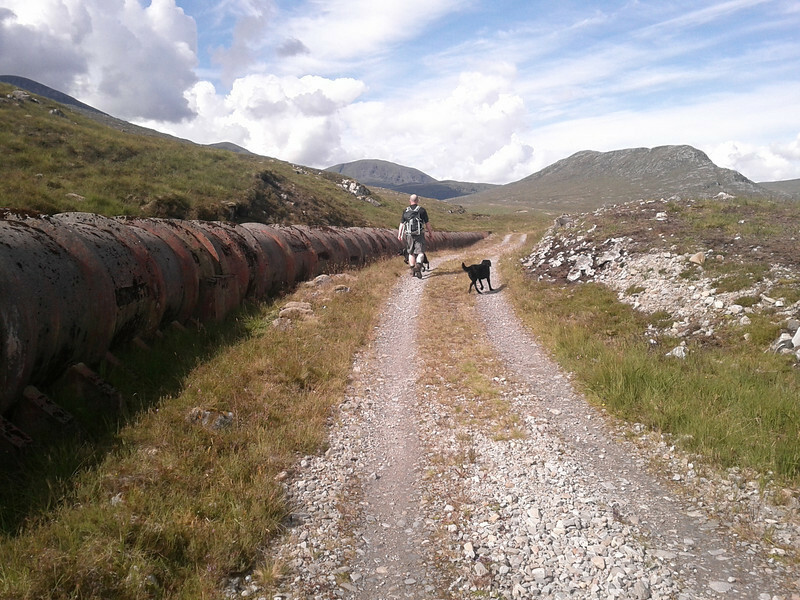 It was still a bit of a relief to get back to yon pipeline-accompanied landrover track though!